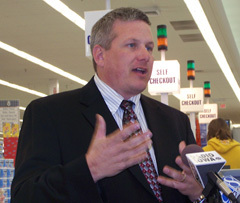 Iowa’s Secretary of Agriculture, Bill Northey, joined the president of the Iowa Grocery Industry Association today to push the "Choose Iowa" program. 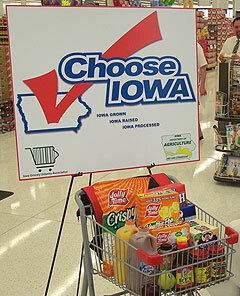 Choose Iowa identifies products made in Iowa and encourages consumers to choose them when shopping. Northey says many Iowa products get lost in all the attention given to the high price of corn and soybeans. "Sometimes when we talk about our commodities, we don’t necessarily think about feeding Iowans and feeding the rest of the world, and we know that we do that," Northey says, "and part of this program is to look at how do we connect the ag production we have in this state with Iowa." The program identifies Iowa made products with a logo that includes an Iowa map and a large red check mark. Northey says the Choose Iowa website identifies the various products. He says they have about 200 products listed, and many of the retailers. Northey says they want consumers to be able to look up the products, and also it helps provide the grocery stores a list of where they can go to get Iowa products. Iowa Grocery Industry Association president Jerry Fleagle joined Northey at a West Des Moines supermarket to tout the program. Fleagle says they want to encourage consumers to ask and seek Iowa raised, grown and processed products. He says they also want to emphasis "the broad variety of high quality, safe and healthy products that are raised grown, and then sold here in Iowa." Fleagle says finding enough of a locally produced product is one of the biggest concerns of retailers. He says the high cost of fuel is one thing that makes locally grown products more attractive to Iowa stores. Fleagle says the transportation costs are not going to go away anytime soon, so if Iowa retailers can find local products with lower shipping costs, he says that has the potential to make Iowa products very competitive in price. Northey and Fleagle say Iowa grown products are a selling point that retailers can highlight. Northey says hopefully the Iowa products will have a better chance of "sorting themselves out" by getting the Choose Iowa recognition in stores. Fleagle agreed, saying "What we would like to do is almost make choose Iowa have a competitive edge in the marketplace." Northey and Fleagle say consumers nationwide are looking for more locally produced food. Northey and Fleagle are touting the "Choose Iowa" program at stops across the state today.